As a child, I hated Epcot. It was boring and just not fun. As an adult, it is definitely one of my favorite Disney parks. The World Showcase is interesting, there are some unique rides in Future World and there is always a festival or event of some kind. The annual Food & Wine Festival is by far our favorite event at Epcot, but all of their festivals are fun. My first trip to the Epcot Food & Wine Festival was probably about 15 years ago and I was instantly hooked! I have been six or seven times over the years and each visit is better than the last. Thinking about the Food & Wine Festival is one of the rare times I envy those who live in Orlando! Grant and Bonnie enter Epcot ready to enjoy the Food & Wine Festival! 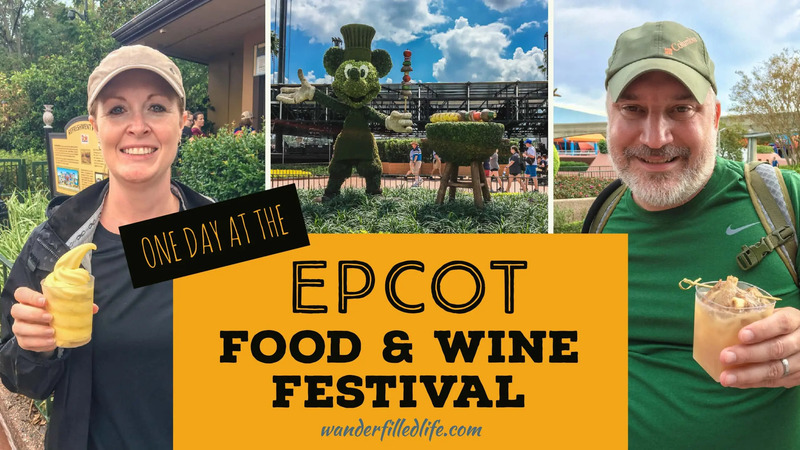 When is the Epcot Food & Wine Festival? The Food & Wine Festival is typically a Fall event. This is pretty good timing, because it is difficult to get excited about over-eating in the summer when its 100 degrees outside! Historically, the Festival has started in mid-late September and run through mid-November. 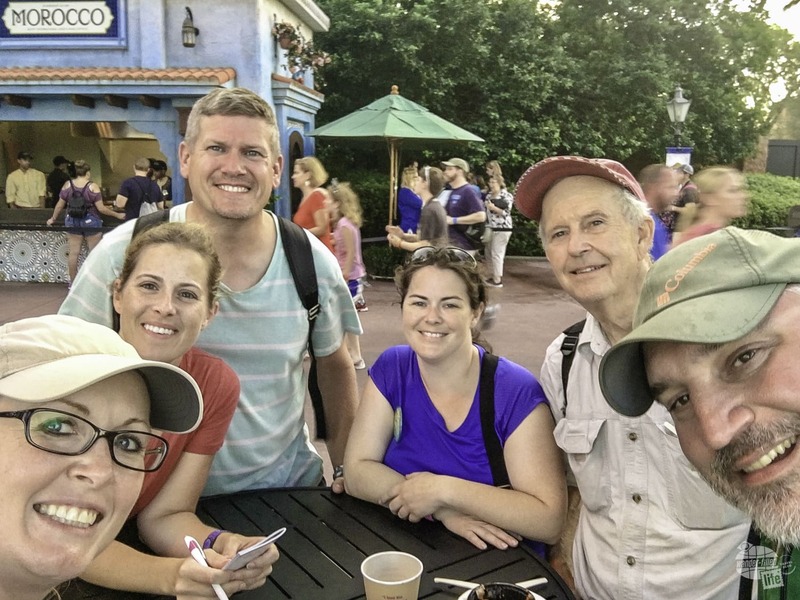 Our Fall Break is typically the third week of September, which made visiting the Food & Wine Festival somewhat difficult for us, without taking time off of work. This year, however, the Festival started at the beginning of September. My sister’s birthday is over our Fall Break, and she is an even bigger Disney fan than I am. Visiting Epcot’s Food & Wine Festival for my sister’s 35th birthday over our Fall Break was just the perfect setup for us this year! September is typically one of the least crowded times of the year for Disney World. 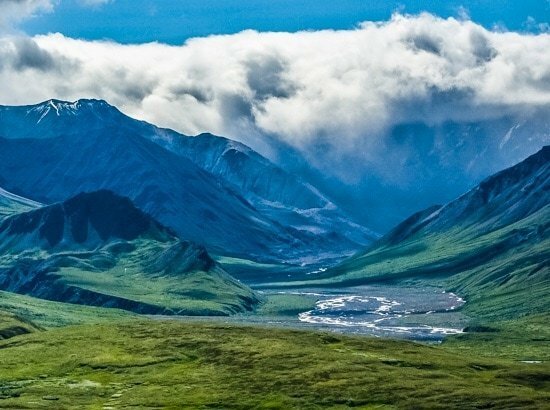 So, if you’re looking to avoid the crowds, and don’t have to worry about taking kids out of school, this is a great time to visit! So, just how does the Food & Wine Festival work? First, you must have a normal admission ticket to Epcot. Thankfully, this is NOT a special ticketed event like the Not-So-Scary Halloween Party. Since we spent a week at Disney World just a few months ago (in February) , we opted for just a one day ticket. 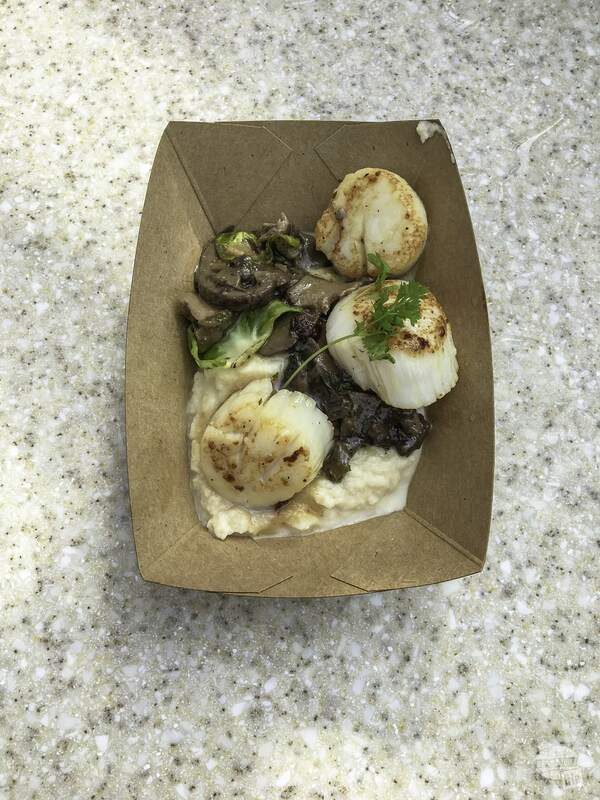 Seared Scallops with a celery root purée. The small portions help keep the prices down and allow you to try a variety of dishes! Once inside the park, the Food & Wine Festival consists of kiosks set up around the World Showcase. Visitors purchase tapas-size servings of each dish. You can spend as much or as little as you want eating and drinking! 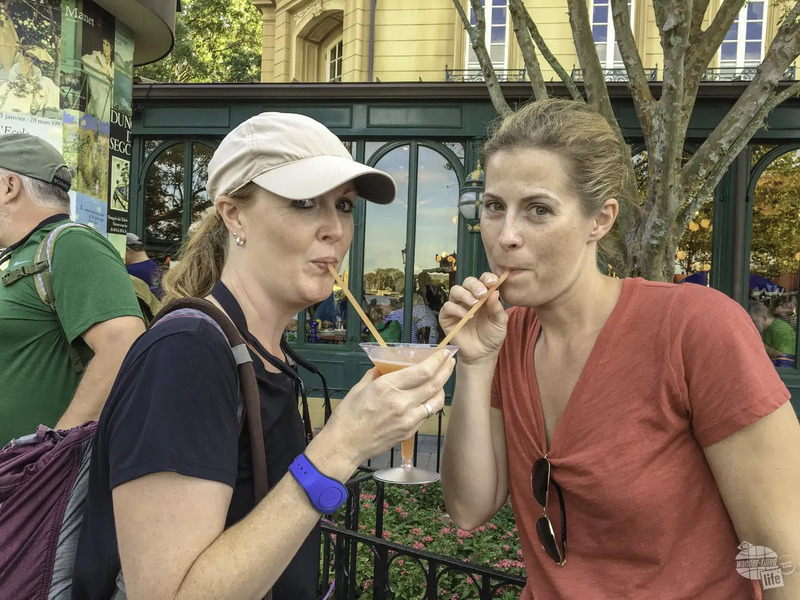 “Drinking around the world” is already a fun event at Epcot. I’m sure you can imagine how much more exciting it is during the Food & Wine Festival! It seems like each year the festival grows. This year was the biggest yet, with 35 kiosks to celebrate Epcot’s 35th birthday! The kiosks wrapped all around the World Showcase and even spilled out into the entrance way towards Future World. So, what kind of food and drink will you find at the Food & Wine Festival? Just about everything! There are special kiosks for each of the 11 established countries around the World Showcase, such as Canada, Italy and China. Grant found a traditional bratwurst at the kiosk in Germany. MMMM! There are also kiosks for additional countries such as India, New Zealand and Brazil. You’ll also find several specialty kiosks including The Chocolate Studio, Farm Fresh and Flavors from Fire, just to name a few. 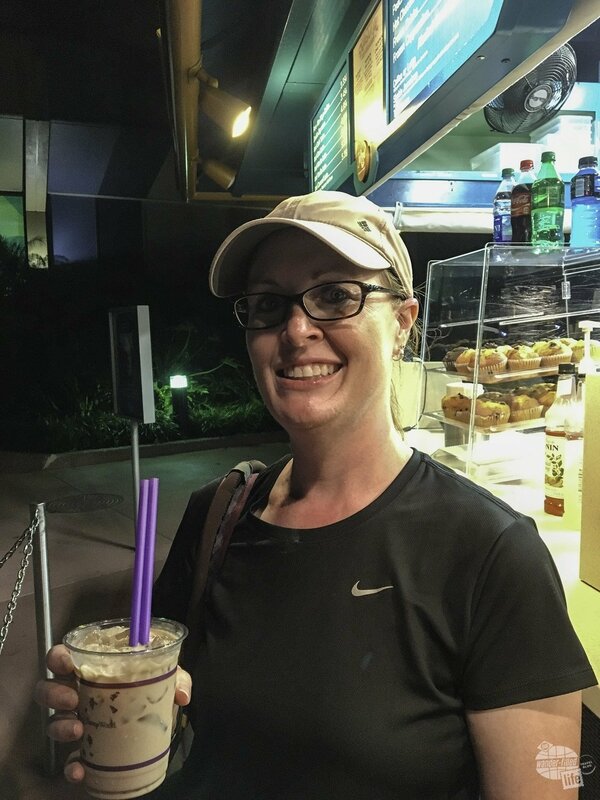 Some of the standard carts and kiosks even get in on the action with specialty items at Joffrey’s Coffee & Tea Company and the Fife & Drum Tavern. Each kiosk has an average of three food dishes and three beverages to choose from. Drinks range from beer to wine to mixed drinks. You can even get flights of beer and, occasionally, wine. While there is no additional admission fee for the festival, it is easy to spend a lot of money buying food and drinks. Food items typically cost $4-$6 per plate. Beer is about $4-$5 for a six-ounce pour. Wine will cost a little more. Mixed drinks are often about $10 each. 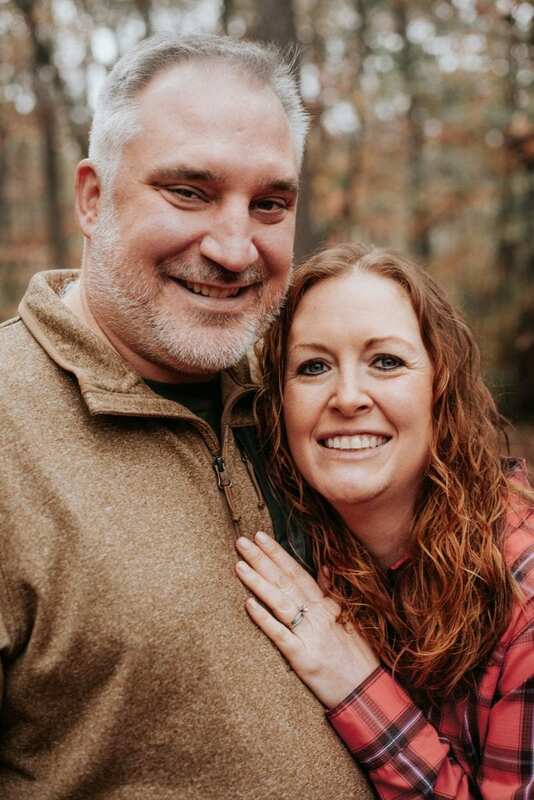 One year, we purchased a gift card to use for all of our purchases. This allowed us to set a limit on what we wanted to spend. Ultimately, we ended up spending a little extra, but at least it kept us accountable for our overall total cost. 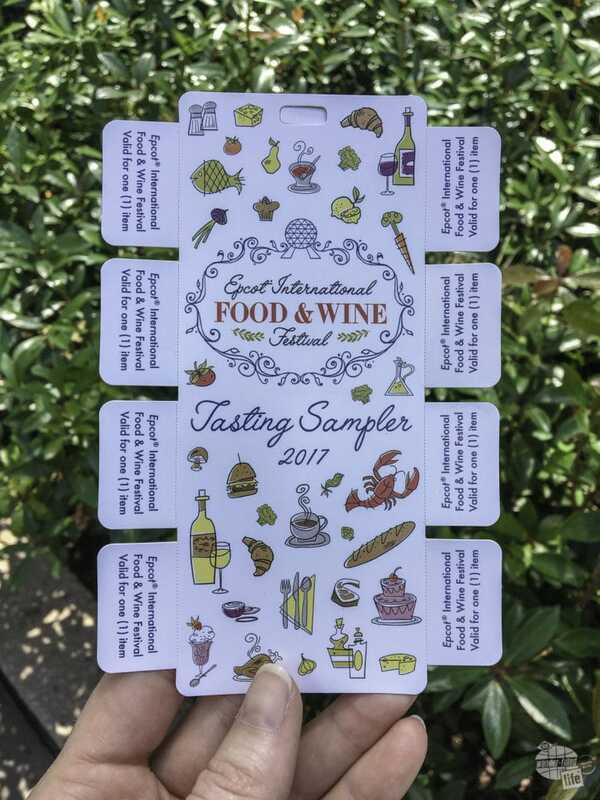 Food and Wine Festival Tasting Sampler vouchers, available for purchase inside Epcot. Each tab is good for one plate or beverage. This year, wanting to earn Ultimate Rewards Points for all our food and drink purchases, we just used our Chase Sapphire Reserve card for most of our purchases. While we tried to not go overboard, it definitely added up quickly! I also joined in with a friend to purchase a Tasting Sampler. With this $65 purchase, we got eight vouchers for food or drinks and a limited edition Food & Wine Festival trading pin. We used the vouchers exclusively on mixed drinks and did manage to get our money’s worth. That said, there may have been a couple of items that we bought just because we had the vouchers that we wouldn’t have purchased otherwise. If you know that you will be purchasing a lot of mixed drinks, you can make it worth it. Otherwise, it’s probably not worth the money, as food, beer and wine are typically less than $8/item. In addition to the food and drink kiosks, there are book signings, culinary demonstrations and concerts throughout the Food & Wine Festival. Some are free and some are an extra cost. During this trip, we did see part of a demonstration by Chef Art Smith. Visitors could purchase a ticket to attend and have a meal. We were just watching from the outside, which was interesting enough. We have seen Chef Smith on several shows and would have loved to attend the demonstration, if we had the money. One thing you can count on is festival-themed topiary. Be sure to take time to enjoy the unique decorations! Some of the recording artists throughout the event include Boyz II Men, Kenny G and Sugar Ray. Not the biggest names in the industry, currently, but still some good entertainment. Concerts are held three times each night, giving visitors ample opportunity to eat and drink and attend the concert. 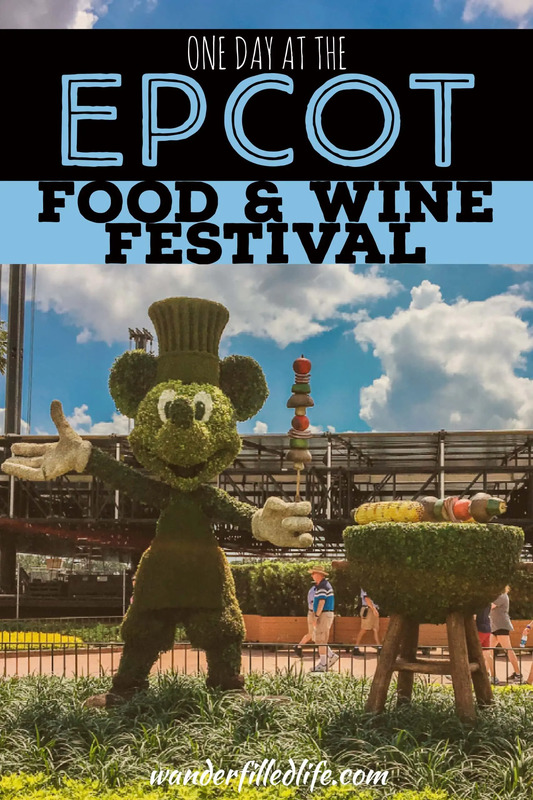 Be sure to check out the Food & Wine Festival web site as you are planning your trip to see what kind of special events are going on while you are there. With 35 kiosks, having about six offerings each, you have well over 200 food and drink items to choose from! Grant and I were there with my dad, John, sister, Molly, and our dear friends, Darrah and Andy. Having a large group to share items with is definitely the way to sample more items than you could on your own! Still, it’s nearly impossible to taste everything in one day. Even with sharing, we only sampled about 30 items. You see now why I envy those living in Orlando who can visit often! My favorite dish of the day was the Mojo Pork with Black Beans, Cilantro Rice and Pickled Red Onions from Islands of the Caribbean. The meat was well cooked and seasoned and overall the dish was just bursting with intensity and excitement! Despite being a traditional dish, it really stood out as having some of the best flavors of the day. 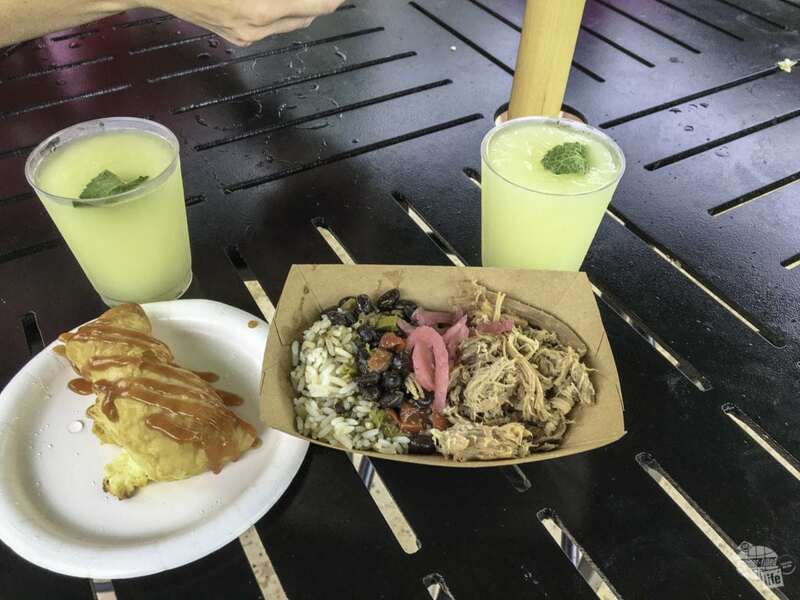 Mojo pork, a quesito and frozen mojitos from the Islands of the Caribbean kiosk. This was definitely a favorite stop of ours! The Zesty Cheeseburger and Cheddar Cheese Macaroni Sandwich from the Epcot Legacy Showplace was probably the most interesting dish. Think macaroni and cheese in a cone made of something similar to pretzel bread. Yum! 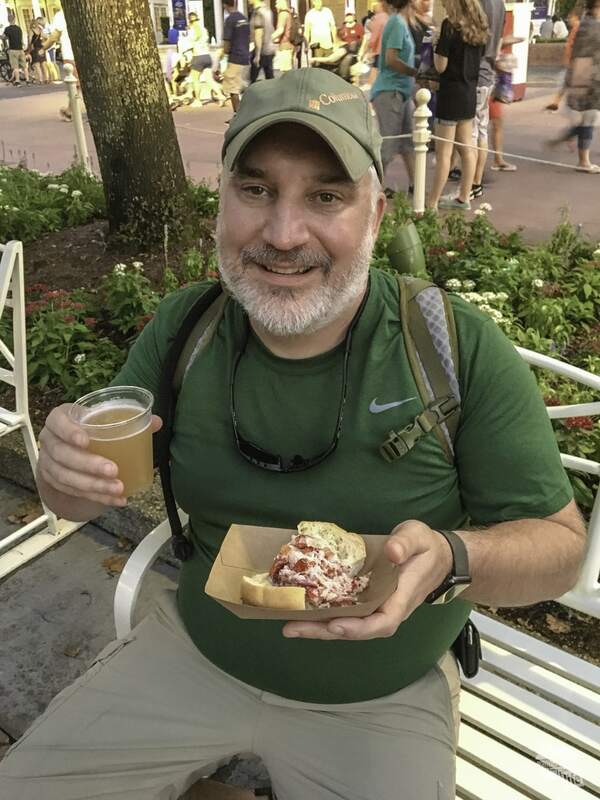 Grant’s favorite dish was the New England Lobster Roll from Hops & Barley at The American Adventure. We enjoyed lobster rolls while in New England a couple of summers ago and this one was spot on in terms of taste. Grant’s favorite was the authentic lobster roll with a Fat Tire white ale. Other favorites for Grant were the Beijing Roasted Duck Bao Bun with Hoisin Sauce from China and the Seared Venison Loin with Wild Mushroom Marsala Sauce and Kumara Puree from New Zealand. The duck was juicy and perfectly seasoned. Grant always enjoys game meats and venison is a particular favorite of his. This dish was seasoned just right, even if a bit over cooked. Unfortunately, venison is often over cooked. Grant’s favorite beer was the Central 28 Trekkerbier Farmhouse Ale out of DeBary, FL, served in the Craft Beers kiosk at Odyssey Center. It had just the right amount of pepper notes, with plenty of drinkability on a hot day. 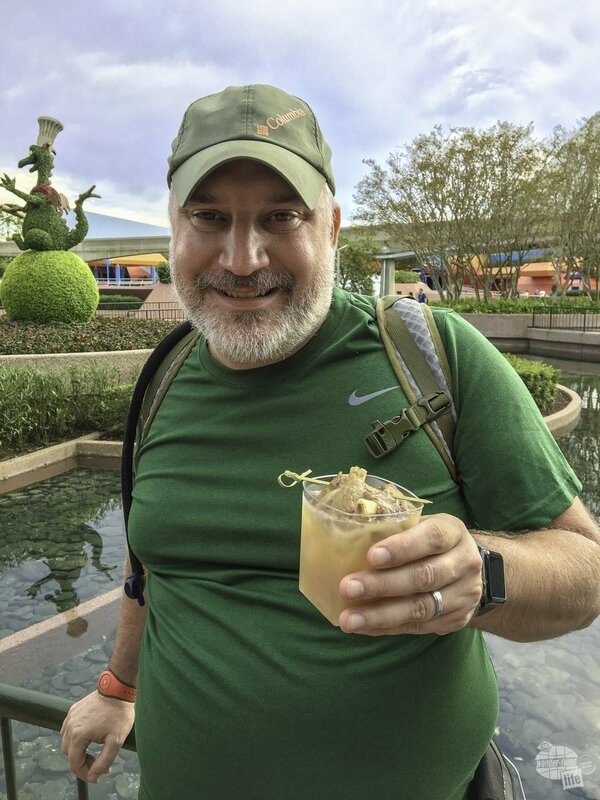 My favorite drinks were the Frozen Mojito from Islands of the Caribbean and the Frozen Margarita with Limoncello and Tequila from Italy. A mojito is a perennial favorite of mine, and there is just something about a frozen mojito that is even tastier and more refreshing than normal! The margarita was a nice big serving with the perfect mixture of sweet and tart. I think limoncello may be the perfect addition to an already outstanding drink! One of the more interesting drinks at the Food and Wine Festival: Swine Brine, cocktail with Evan Williams and garnished with a pork rib. For both of us, the most interesting and unique drink of the day was the Swine Brine featuring Evan Williams Bourbon from the Flavors of Fire kiosk. A mixed drink including apple cider and a hint of mustard, it was served with a pork rib on top! While it was not something that I will be seeking out again, it definitely was interesting and worth a try. Flavors of Fire also served up the most interesting dessert of the day, Chocolate Picante. This was a dark chocolate mousse with cayenne pepper, chili powder and raspberry dust. There were a few bites that packed a bit of heat, but overall it was just a very tasty chocolate mousse. It’s hard to go wrong with chocolate mousse! Our all time favorite Disney World treat, by far, is Dole Whip. If you aren’t familiar with Dole Whip yet, you should be! 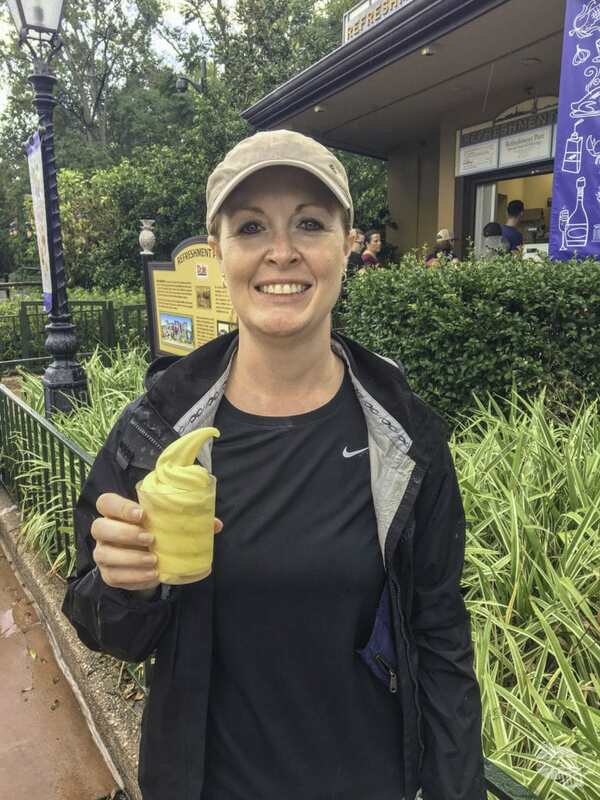 A non-dairy, soft-serve pineapple treat, Dole Whip is one of the most popular snacks at Walt Disney World and Disneyland. There is nothing more essential in terms of Disney food than a Dole Whip! At Epcot, Dole Whip is served at the Refreshment Port, and is typically available year-round. You can get it in a cup, as a float (with pineapple juice), or my favorite, with Bacardi Coconut Rum. It used to be served with Meyer’s Dark Rum, but I guess they’ve changed that since my last visit. Or maybe they were just doing something different for the Food & Wine Festival. Regardless of how it is served, Dole Whip is delicious! If you haven’t had one yet, do yourself a favor and find one ASAP. I’ve only ever seen it at Disney World and the Dole Plantation in Hawaii. Supposedly, you can find it other places, but I’m not sure I believe that. Our advice: Save up your money, come hungry and don’t count calories! A visit to the Food & Wine Festival will not be cheap. 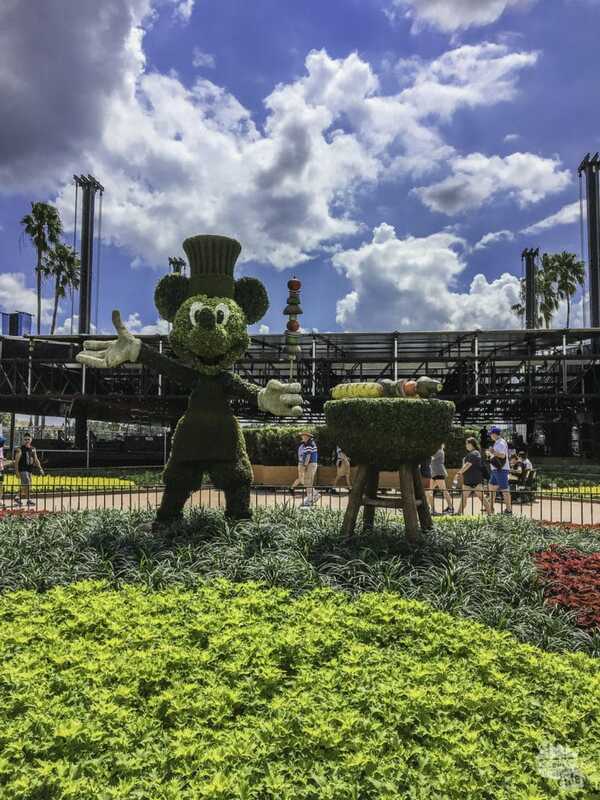 If you have an annual pass, or are already planning a trip to Disney World, then attending won’t cost you any extra in terms of your admission ticket. Our one-day ticket, though, was just over $100 each. 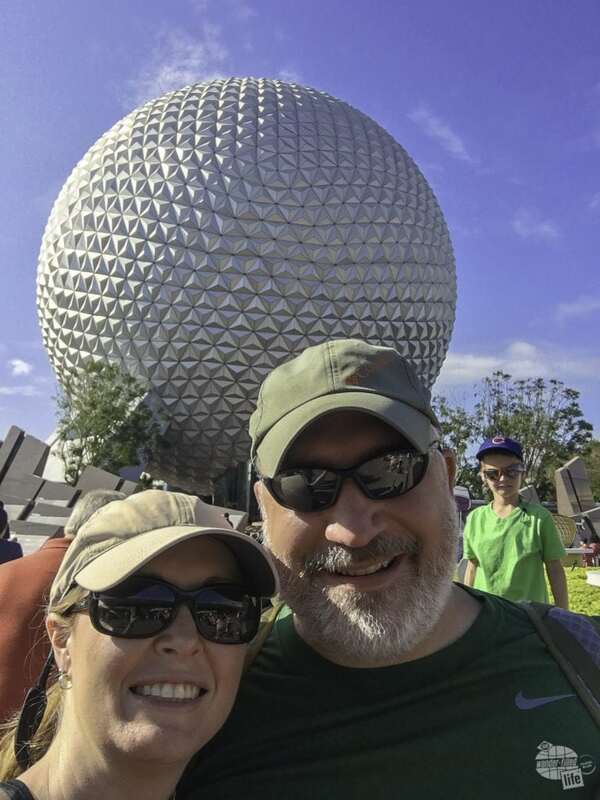 While we did ride a few rides (Mission: Space, Test Track and Soarin’), overall we did not do as many rides as we would on a “normal” visit to Epcot. The Food & Wine Festival is even more fun with a group of family & friends! From left, Bonnie, our friends Darrah and her husband Andy, Bonnie’s sister, Molly, Bonnie’s dad, John, and Grant. So, we basically paid $100 each to be able to spend money on food & drink. It was worth it, though! We enjoyed the unique dishes, tasty treats and, most importantly, time spent with our family and friends. Going with a group is great because you can try so many more dishes (as long as they are willing to share). In addition to what Grant and I purchased, we had at least a bite or two of anything that someone else bought. Still, we didn’t come close to trying all 200+ items! In terms of the calories, just remember that you’ll be walking a lot! When we were there, I got in roughly 17,500 steps in one day. While I’m sure you’ll consume more calories than you burn, sometimes you just gotta splurge! When we attend, we usually spend the morning riding some rides, since World Showcase usually doesn’t open until about 11:00. Once the kiosks are open, it is lunch time! Be careful, though…you have to pace yourself once you start eating! It is easy to overdo it on food or drink very quickly because everything looks good. We then take a break around 3:00 to ride some more rides. Living with the Land, Soarin’ and Spaceship Earth are good options at this point, because they are tame. I certainly would NOT advise the more intense version of Mission: Space after you’ve started eating! Once you’ve rested and allowed your food to settle, start eating again from the “other side” of the circle! Be sure to look for the Festival Passport once you are in Epcot. This small booklet lists out all the kiosks and menu items. I flipped through everything and wrote down the top items I wanted to try. Sometimes, you will have to make tough decisions because there just isn’t enough time, money or room in your stomach for everything! Indeed, despite my best planning, I missed out on several dishes and beverages that I wanted to try. If you are already planning a trip to Disney World during this time, absolutely! It really doesn’t cost you anything extra and you are going to have to buy food once you’re in the park anyway. While the food at Epcot is typically outstanding any time of year, the offerings during the Food & Wine Festival are even better than normal. Individually, the prices for Festival dishes are very fair. Bonnie and our dear friend Darrah enjoying La Passion Martini Slush. Sharing plates (and costs) is one way to keep your budget under control. If you’re thinking of going just for the Food & Wine Festival, like we did, it is definitely harder to justify the cost. But, we still think it is worth it. The wide range of dishes and the quality of all the dishes is simply outstanding. Seriously, everything we have tasted has been delicious and expertly prepared. You may occasionally get an overcooked piece of meat or flavors that just aren’t to your liking. The overall quality of the food, especially at the rate they are producing it, is top notch. Each dish is representative of flavors of the country or themed kiosk serving it. Typically, the chefs preparing the dish are from that country or region. Is it better than any other food festival? Honestly, we haven’t been to a lot of food festivals, so I don’t have much to compare it to. But, it is probably difficult to find another food festival with the same range of authentic international dishes that Epcot serves. Of course, you can always ride the rides if you get tired of the food! If you are planning ahead, September really is a great time to visit Disney World. The crowds typically are not very heavy, the wait times are comparatively short and it is at least a little bit cooler than June or July. If you can plan your visit during the Food & Wine Festival, you’ll just have one extra bit of excitement for your visit! The menu stays the same throughout the event, which this year runs until Nov. 13, 2017. Additionally, most of the kiosks are the same from year to year. Indeed, many of the dishes are repeated each year. So, if you can’t make it this year, you’ll likely find these same dishes, and more, in the future! Somehow, Epcot does find a way to add more and more each year. Spiked Chai Latte – one final drink before heading out. 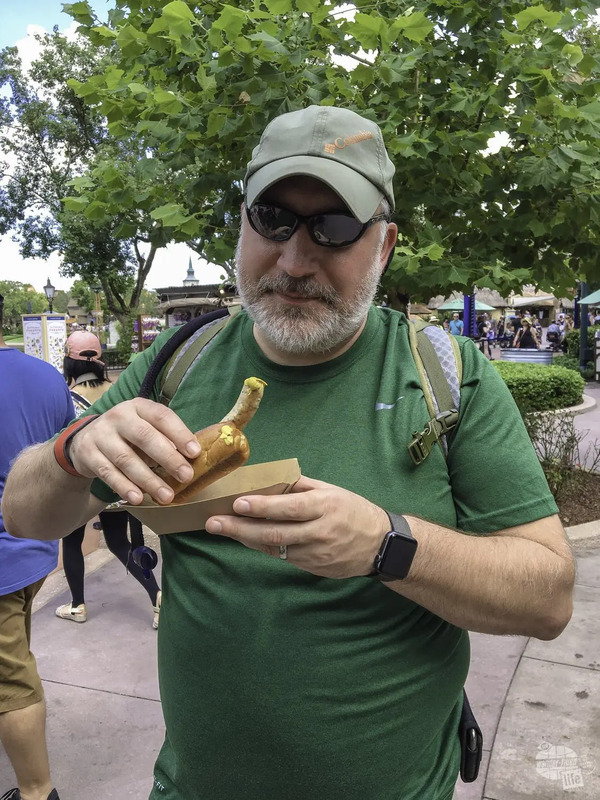 Overall, we recommend the Epcot Food & Wine Festival for anyone who enjoys food! Being a Disney fan helps, but it is not essential. In fact, I think that is one reason why adults love Epcot so much, in that it is not typically “Disney” in terms of princesses and fairy tales. You’ll certainly find some of that, but it is not the prevailing theme, like it is at Magic Kingdom. Epcot is a celebration of technological innovation, evident in Future World, and international culture, found in the World Showcase. The Food & Wine Festival combines these themes for innovation in food around the world. A day spent at the Food & Wine Festival will be one filled with fun and unique flavors. And, it will probably leave you wanting even more! Looking for more on Walt Disney World? 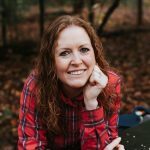 Check out our trip with our nieces earlier this year. We also visited Universal and you can read about our experience here.